Something very worrying has happened and it’s difficult to know which of the two possibilities is worse. Either some form of Border checks is inevitable in the wake of a no-deal Brexit, or at this late stage in the game a minister central to the process still doesn’t understand the much eulogised ‘backstop’. The impact of a hard Brexit on the transport sector has the potential to be devastating. Air travel, shipping and road haulage all face severe challenges. 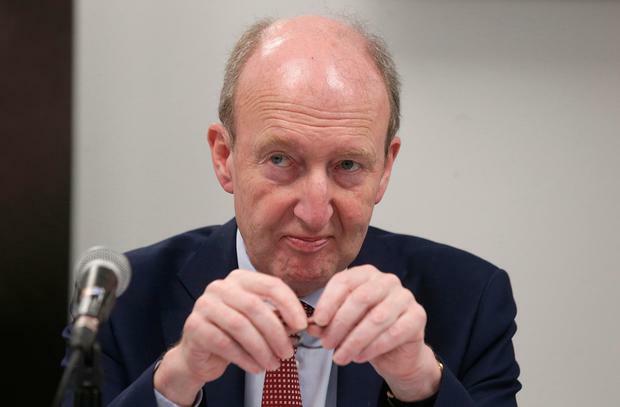 Therefore, as we careen towards a worst case scenario, the role of Transport Minister Shane Ross in the process can only increase. Yet when he appeared alongside Tánaiste Simon Coveney and Health Minister Simon Harris to reassure the nation, he appeared to be in another world. Mr Coveney attempted to mop up the mess yesterday as he claimed a private conversation they had about Border checks related to the backstop. Apparently, the least worst explanation was the terrifying idea that he had to explain the central pillar of the deal to his colleague. In reality though, the question put to Mr Ross during the press conference related to a no-deal scenario. He was asked if a truck came from Scotland to Antrim by boat, could it then drive straight to the Republic without any checks. “I would anticipate that there would be checks,” Mr Ross said, before being cut off by the Tánaiste, who insisted there is no secret plan for Border controls on this island. Fianna Fáil leader Micheál Martin summed up the exchange by saying it “suggests the public are not being told the full truth for party political reasons”. “It is like the episode from ‘Fawlty Towers’, ‘Whatever you do, don’t mention the war’,” Mr Martin told the Dáil. However, the public concern should run much deeper than the confusion between ministers. Mr Ross was asked a string of other questions during the briefing and routinely failed to provide adequate answers. Have Irish authorities any plans to do trial runs at Dublin Port based on possible checks to see how it impacts on traffic in the area? On alternatives to the landbridge, which sees Irish trucks use the UK as a route to mainland Europe, he said direct sea routes from Dublin and Rosslare to France are the priority. But then he admitted there “hasn’t as yet seemed to be a great deal of appetite for that switch”. Mr Ross was asked if he had a list of products with limited shelf lives. “We just don’t know exactly the answer to that question which is why we are looking at the alternatives,” he answered. It’s no secret that many in Fine Gael doubt Mr Ross’s ability to handle a major crisis – but he has to get on top of it. Otherwise he’ll end up like Basil Fawlty when asked by a guest if he knew anywhere that served French food. “Yes, France, I believe,” was the response.